Is it your first time managing a sales team? Or are you struggling with managing your existing sales team? Our guest today may just have the perfect tool for you. 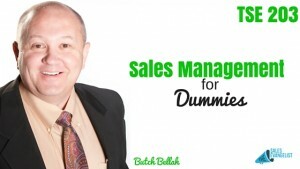 It’s a book he’s written called Sales Management for Dummies. Butch Bellah is a speaker, sales trainer, and author. 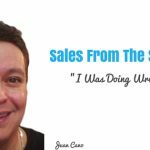 He works with salespeople to gain more appointments, win more business, and retain more customers. Based in Dallas, Texas, Butch helps people find areas in the sales process where they have hung ups and he is truly passionate about professionalizing the profession of sales. His first book, The 10 Essential Habits of Sales Superstars: Plugging Into the Power of Ten which hit #1 on Amazon’s list of Sales Books in August 2014 (and he has a picture to prove it!) paved the way for John Wiley & Sons publishing to approach him where they asked him to write a book, Sales Management for Dummies. In this book, Butch offers a handy go-to guide for sales managers covering areas like management, building a commission program, budgeting, resolving territorial disputes, etc. – all necessary for creating a solid and successful sales team. Be very careful with people’s money. Check it multiple times and test it for 6 weeks before you ever roll it out there. What motivates one might demotivate another. As a sales manager, you need to wear different hats. Set your sales goal high, set your sales budget low, set your forecast about where you think it’s going to be. Keep the inspirational fires burning. You can’t motivate someone to do something. But you can inspire them and give them a reason to be motivated. Find out what it is they’re striving for or the gold standard for them. Adapt your personality to every sales person. 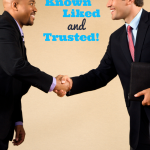 Learn the in’s and out’s and nuances of each individual personality. Doing the same thing for everyone might cause you to lose really good people that don’t like to be managed that way. Set a schedule and agenda. Work with a sales meeting calendar and plan ahead the topics to include. Back plan everything and know when you want to roll it out. Butch thinks Saturdays are the best time for sales meetings to avoid pulling them out of the market during weekdays. Your team can get tired of hearing you all the time. Break that monotony. Keep it interesting. Give them a reason to want to go to your sales meeting. Offer something of value that they’re going to get from the meeting. Get people comfortable to ask questions, overcome questions, build rapport, and do the basic steps you’re supposed to do all the time. This is a time for you to inspect what your people are doing. Hit the ground early Monday morning and have an appointment schedule for late Friday. Take 10 minutes at the end of everyday to make sure you’re ready for the next. Take 30 minutes on Sunday afternoon or evening to prepare for the week. Take an hour at the end of the month to look at the entire upcoming month and write down your goals. Forget what you’ve heard about ABC (Always Be Closing)… it’s Always Be Prospecting! Get out and meet new people. 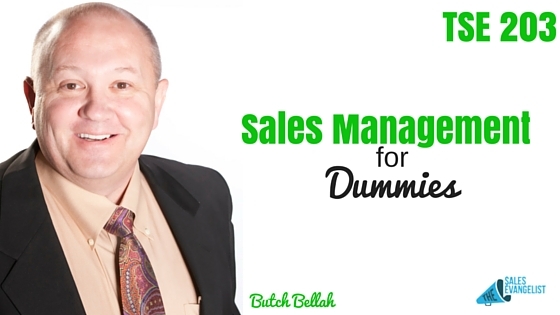 Get in touch with Butch through www.butchbellah.com or connect with him on Twitter @salespowertips and Facebook B2TrainingAndDevelopment.